CULTEC Chambers Supported By Hydrocad® - CULTEC, Inc.
CULTEC, Inc. products are fully supported by the HydroCAD Stormwater Modeling System, making it easy to design and model underground retention and detention facilities that employ CULTEC chambers. CULTEC and HydroCAD formed their alliance back in 2003. Up until that time, the software program had never modeled chambers or a specific proprietary product –this is just one example that shows how CULTEC strives to think up new developments and relationships to make the design phase as painless as possible. HydroCAD 10.0 includes all current CULTEC chamber definitions, plus a chamber wizard which greatly simplifies the layout, pricing, and modeling of underground storage systems. Users of earlier versions can update at very reasonable rates. CULTEC is pleased to offer the special HydroCAD CULTEC Edition to it’s customers absolutely free of charge. With the CULTEC Edition you can construct basic watershed models of up to 5-nodes, including complete storage, runoff, and routing calculations using CULTEC chambers. Since the CULTEC Edition will replace any previous HydroCAD installation on your PC, existing HydroCAD users should generally obtain a version update in order to retain all the capabilities of their existing software. In a HydroCAD model, stormwater chambers typically appear as part of the storage definition for a “pond”. In the simplest case, HydroCAD calculates the available storage for use with other calculations. But more often, it is used to generate a complete inflow or runoff hydrograph and route it through the pond. The resulting analysis indicates the water levels attained throughout the rainfall event, as well as any discharge that may occur through outlet devices or infiltration into the surrounding ground. 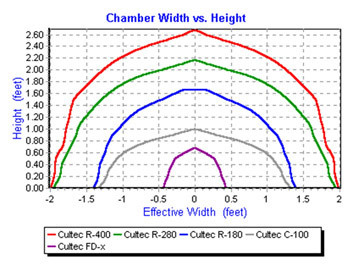 Setting up a pond to use CULTEC storage chambers is a simple process: Just pick the desired model(s) from the drop-down list, and specify the number of chambers plus their elevation. HydroCAD supports all CULTEC, Inc. chambers, including all Recharger, Contactor, HVLV, and Field Drain models. For embedded storage calculations, the underground storage wizard automatically creates the associated drainage field based on the specified layout parameters. Using the built-in chamber definitions and stone voids, a complete stage-storage curve is instantly available for reporting or further analysis. Please see the HydroCAD web site .